Just wanted to let all my followers and viewers that today I'm being featured by John Hughes over at "An Educator's Life". 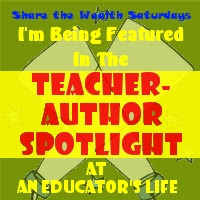 On the 2nd and 4th Saturday of each month he features Teacher-Authors and on the 1st and 3rd Saturdays he "Shares the Wealth" with a ton of wonderful freebies from some wonderful teacher-authors. You can find out all about me and get some great links to products and freebies by clicking on the button above. COngrats Arlene on being featured. I am just now checking my email and saw your post. I am going over there a little late to check it out. Better late than never right??? thanks so much Sharon. You are so sweet. Hope things are going well for you.